9) Paper FastPass tickets -- Paper FastPass tickets are perhaps one of the things that are forever gone from Disney World that we weren’t so sad to see go. 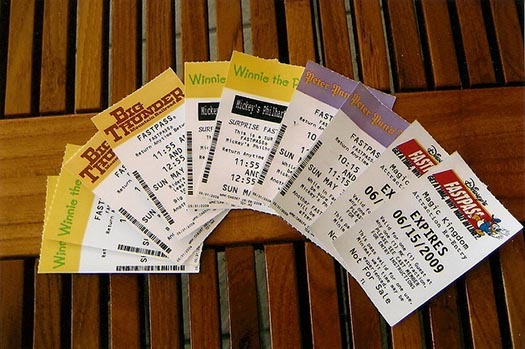 Do you remember the days of FastPass tickets? The FastPass+ system is so much easier to use. No longer do Guests have to secure paper FastPass tickets—and then keep up with them! And what if they were lost? Got wet? Disney definitely has a much better thing going with the new FastPass+ system, in which Guests can make FastPass+ selections via the My Disney Experience app or online at www.MyDisneyExperience.com. Those selections are then linked to the Guests’ tickets and/or MagicBands. Once it’s time to experience an attraction for which a Guest has made a FastPass+ selection, he or she simply taps a ticket or MagicBand at the FastPass+ kiosk and proceeds to enjoy the attraction. Saying goodbye to the paper tickets also meant saying goodbye to the frustration of losing them. The new system also saves time over the paper version.